Product No. GMDK01; dimensions 17 x 11 in. ; full-color printed on cardstock; predominant colors: blue and orange. David Knapp has had a long career, not only as a foundryman, but also as an artist. He has been painting foundry scenes since 1971. His scenes are vivid with color and action, as each painting depicts a specific operation or operations going on in each facility. 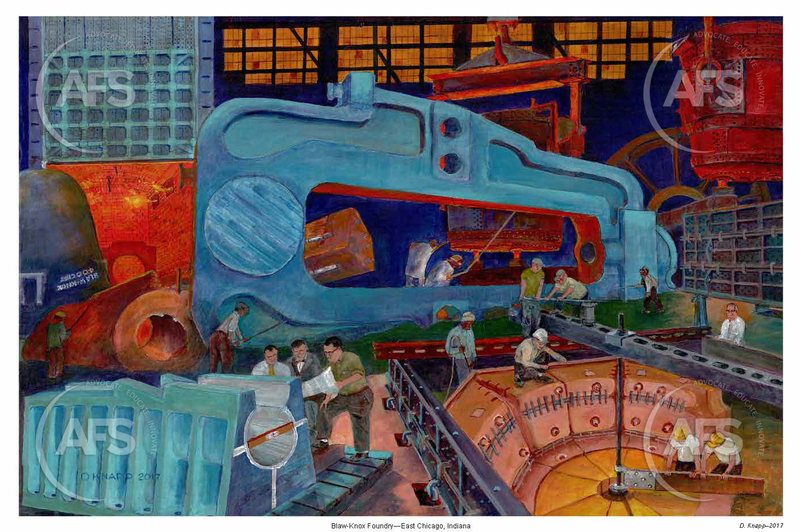 In the Blaw-Knox Foundry print, the scene includes a rolling mill stand, a bridge saddle for the Mackinac bridge in Michigan, a pit mold for a 90-ton vibratory rock crusher, and a stern tube for a shipyard. The Blaw-Knox Foundry was located in East Chicago, Indiana, and closed in 1986.